Project Template is a Starter plan feature. It allows you to to create many similar projects quickly. Projects created using an existing Template have settings such as Billable Rates, Estimates, Tasks and Team already applied. There are two approaches to setting up a Project Template. You can create a template from an existing project or create a new project just for the purpose of creating a project template. If you choose to create a template from an existing project you need to have Administrator access rights to choose any project from the list of projects on the Projects page. If you are a regular user, you will only be able to create templates from projects you've created yourself. 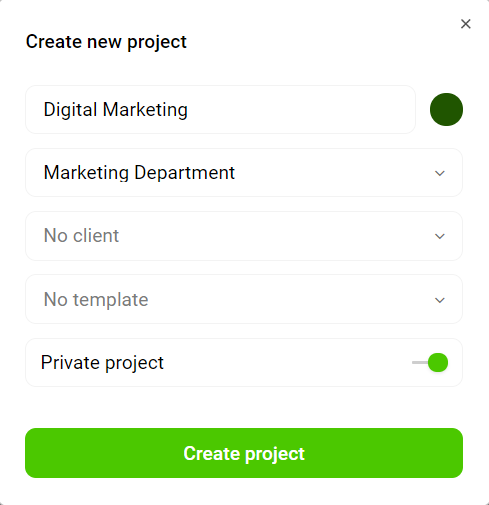 Whichever approach you choose to go with, you need to access the settings page for that specific project by clicking on the project from the list of projects on the Projects page. Removing a Project Template requires you to locate the project in question on the Projects page, click on that project to access its settings page and then use the cogwheel icon in the upper-right corner of the page to see additional options - select "Don't use as template". Now that you have your template set up you can easily apply it to a new project. Considering that there are two ways of creating a new project there are also two places where you can apply your Project Template to a new project.